Jen Morel has worked in the newspaper industry since 2007. An experienced backpacker, she is a contributor to "AMC Outdoors" and other hiking/environmental magazines. She holds a Bachelor of Arts in cognitive science and philosophy. Delayed soreness from a hike is sometimes preventable. Nutritional supplements, stretching, proper footwear and trekking poles are touted as having preventive powers when it comes to the aches and pains of a hike, especially one with prolonged periods of descent. If you're past the stage of prevention, anti-inflammatory medications reduce pain, but the ideal treatment is rest. Although uphill hiking feels more difficult, hiking downhill is more often a cause of aches and injuries. The force placed on your hips, ankles and knees from downhill hiking is greater than that of uphill hiking. Trekking poles can prevent the soreness that results from prolonged downhill hiking. Using poles removes some of the force placed on your body and reduces your odds of later aches and pains. If your body aches after hiking, the pain is most likely due to delayed onset muscle soreness, or DOMS. It may persist for two to three days after the hike; it's the result of pushing your body beyond its accustomed limits in terms of intensity or duration. DOMS normally sets in about a day after the hike; it sometimes lasts as long as a week. Although the cause is not certain, it may result from connective tissue damage, slight tears in the muscle or inflammation. Resting your body is the best way to relieve DOMS. If you need to continue hiking or take part in other physical activities, ibuprofen or aspirin can help reduce your pain and permit you to participate. Some of these drugs may have negative side effects on your digestive system or blood pressure. Stretching, massaging the aching muscles and applying ice to the aching area present a few alternatives to medication. Warm up before a hike. Stretch both before and after the hike to prevent DOMS. By preparing the body for exercise, you reduce your chances of muscle damage and other injuries. Warming up improves your flexibility and performance during the exercise by increasing your core body temperature, which readies your muscles. The ideal warm up for a hiker is to spend the first 10 or 15 minutes of a hike walking at a moderate pace. Introducing lower intensity exercises into your schedule one to six weeks before a big hike is another method of reducing your odds of aching afterward. Aches that persist for more than a week sometimes indicate Lyme disease. This disease is caused by a bite from an infected tick transmitting the bacteria Borrelia burgdorferi. 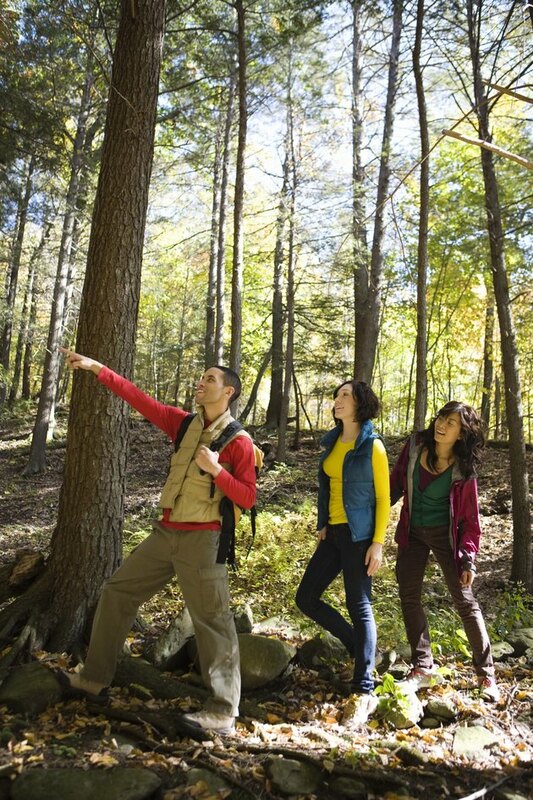 Check yourself for ticks after a hike; see a doctor if your ache persists. Although Lyme disease is most common in the eastern half of the United States, it exists in all parts of the country. Ticks are found in grassy and woodland areas. Other symptoms of Lyme disease include a bull's eye rash accompanied by flu-like symptoms, a headache or a stiff neck. Lyme disease can become a serious condition if left untreated.